Save yourself the embarrassment of ill fitting shirts this summer by upgrading to our fully bespoke shirts service. Is there any sartorial shame worse than removing your beautifully tailored bespoke suit jacket to reveal a crumpled, creased, oversized shirt? Mass produced off the peg shirts are made with a broad range of the male population in mind. They are cut accordingly, with a generous fit, to cover many shapes and sizes. Some may buy off the peg shirts and have them adjusted by their tailor, for a more pleasing fit. This can be a good option for some, but nothing comes close to the individual fit of bespoke shirts, especially for the bespoke connoisseur. 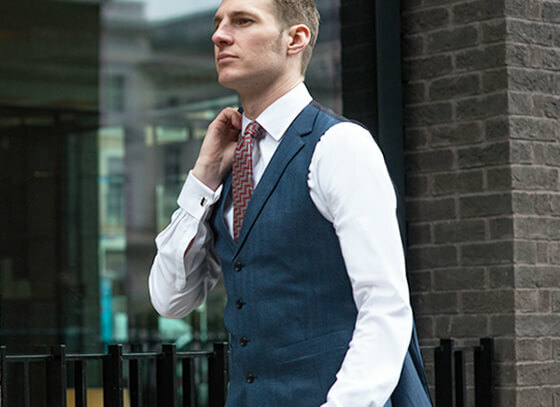 Not only will your suit jacket and waistcoat thank you for allowing them to sit on your body as they should, but you will reap the rewards in ease of movement and increased comfort via the shirts high cut armholes (read more about why this is so important here). We have recently introduced a Cad & The Dandy core range of signature cloths for our bespoke shirts. These have been selected by our tailoring staff, specifically with our customers in mind. From plain cottons, to city stripes there are designs and weights to cover every climate and occasion. Prices start at £150 for one shirt but ordering four bespoke shirts at the same time reduces the price to £120 per shirt. Style options vary from collar and cuff types, number of buttons, short sleeves, dress shirts, business shirts and casual polo shirts. We can also organise embroidery for personalisation and special occasions.